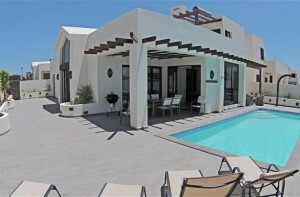 This villa with wifi internet in Playa Blanca is available for holiday rentals. It has a private heated pool and a pool table. This villa with wifi internet in Playa Blanca is situated just a 5 minute drive or 25 minute walk from the centre of the resort and the beach. There is a private heated pool with outdoors shower. The pool is surrounded with sun loungers for sun-bathing and there is also a table and chairs for alfresco dining, as well as a Canarian-style barbeque. The lounge is comfortably furnished and is well equipped for entertainment. There is a 50 inch Smart TV with satellite channels, as well as free wifi internet access. There is alao a DVD player and an XBox 360 with a selection of DVDs and video games. There is also a TV in the 2nd bedroom. The master bedroom has a large double bed with 2 balconies, one of which has sea views. There are two single beds. There are two bathrooms with bath and shower overhead, wash hand basin and WC. The modern kitchen has a washing machine as well as the usual appliances such as a full oven, microwave, hob etc. 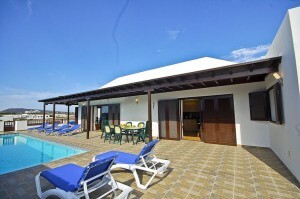 Situated in the Rubicon Marina area of Playa Blanca in Lanzarote. 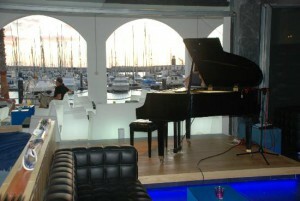 The Blue Note Jazz Bar and Restaurant is situated in the Rubicon Marina area of Playa Blanca in Lanzarote. It serves Spanish tapas and seafood, as well as cocktails and wine. The menu includes several local fish dishes, something that can be surprisingly hard to find in other restaurants, considering the location. The restaurant has over 900 reviews on TripAdvisor. Over 840 of these rate the restaurant as excellent or very good. The restaurant has also been awarded the Certificate of Excellence. Reviewers talk about the delicious food, the first class presentation of the dishes as well as the excellent service. The restaurant is also very good value for money: 5 tapas cost just 12 euros. 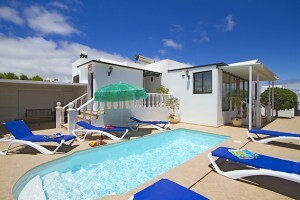 A holiday villa in Playa Blanca Lanzarote with private heated pool and free wifi internet access. The villa also has satellite TV. Villa Erin in a three bedroom two bathroom holiday villa in Playa Blanca Lanzarote with free wifi internet access and satellite television including English channels. The villa has a private electrically heated pool and a childrens pool with a waterfall feature which can be turned on and off depending on guests preference. There is also a table tennis table beside the pool as well as the usual sun loungers and seating/dining areas. There is one double room and two twin rooms. The bedrooms upstairs enjoy sea views. The kitchen is fully equipped including a dishwasher and there is a separate utility room with washing machine. Italian restaurant situated on the water front in Playa Blanca. Ninen Lanzarote is a family-run Italian restaurant situated on the water front in Playa Blanca. It enjoys marvellous sea views across the harbour, as you can see in the photo to the left. It has received outstanding reviews on TripAdvisor, and is rated no 3 out of 160 restaurants. It has also be awarded the Certificate of Excellence on this site. There are lots of good vegetarian options, which customers class as delicious: this has to be a sign of an excellent restaurant in my opinion. It is a small restaurant, so it is advisable to book a few days in advance. Lorenzo and the staff are friendly and helpful. The menu is small consisting of the usual Italian dishes, but the food is homemade and freshly cooked. The menu includes lasagne, porcini tagliatelle, seafood ravioli, tagliatelle gorgonzola and noci, meatballs, rigatoni arrabiata (garlic and chilli), tagliatelle with pesto and pinenuts, mushroom ravioli with cheese sauce and the mixed meat and cheese platter. For dessert the cheesecae and taramisu are highly recommended. A three bedroom villa in Puerto del Carmen with sea views. There is a private heated pool and separate childrens’ pool. This villa in Puerto del Carmen with sea views has three bedrooms and two bathrooms. Outside there is a private heated pool and separate childrens’ pool. The sun terrace is equipped with sun loungers and a covered terrace with patio furniture for alfresco dining. The villa is well equipped with wifi internet access, satellite TV, a dishwasher and a washing machine. There is also a games room with a pool table which converts to a table tennis table. Two of the bedrooms have double beds and the 3rd bedroom has two single beds. There are two bathrooms including one ensuite. Situated in the heart of Puerto del Carmen. 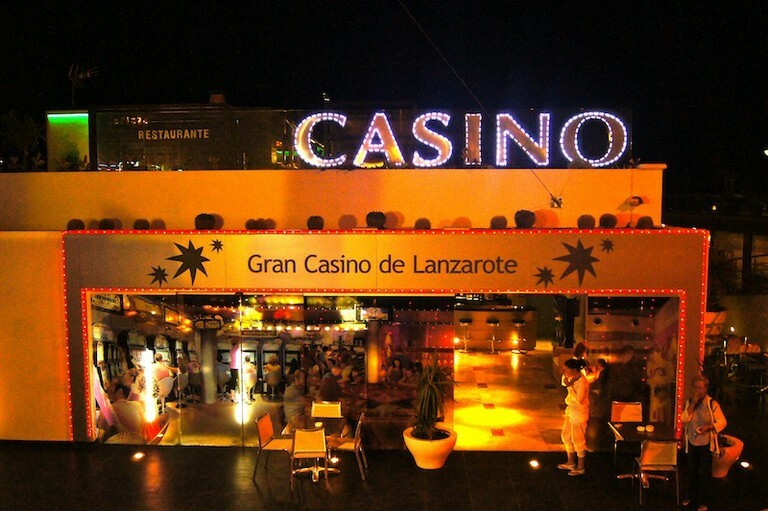 The Gran Casino de Lanzarote is situated in the heart of Puerto del Carmen on the Las Playas Avenue and is slightly smaller than other European casinos. It has a great ambience where clients can enjoy a night full of excitement. The games tables include poker, black jack and roulette. There is also a hall of 39 slot machines, a restaurant serving fine international cuisine called Fortuna, a coffee shop and a roof terrace which enjoys great views of the harbour. On the roof terrace you can enjoy some tapas and cocktails. There are also poker tournaments every month. The dress code is smart casual, no tie or jacket required and shorts are not allowed. Only over 18s are allowed. The entrance fee is just 3 euros. Make sure you bring your passport for identification. The Grand Hall is only open at night but the other areas of the casino are open between 10am and 4pm daily. A four bedroom holiday villa to rent in Playa Blanca Lanzarote with air conditioning and wifi internet access. The villa also has a games room with table tennis table. 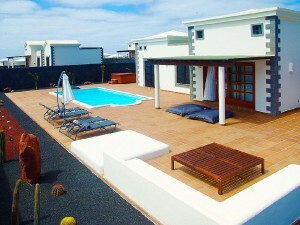 This modern holiday villa to rent in Playa Blanca Lanzarote has been built over 2 levels. It has a private heated pool, a large sun terrace with sun loungers and an alfresco dining area, partially covered by a pergola. 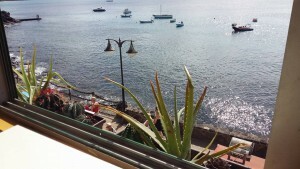 There is also a roof terrace which enjoys good sea and mountain views. Inside the villa is very well equipped with full air conditioning over both levels, wifi internet access and satellite TV. There is also a games room with a table tennis table and a spinning bike. A separate TV room is also provided which has a sofa bed, satellite TV and a Play Station to keep the children and adults happy! There are four bedrooms and three bathrooms. 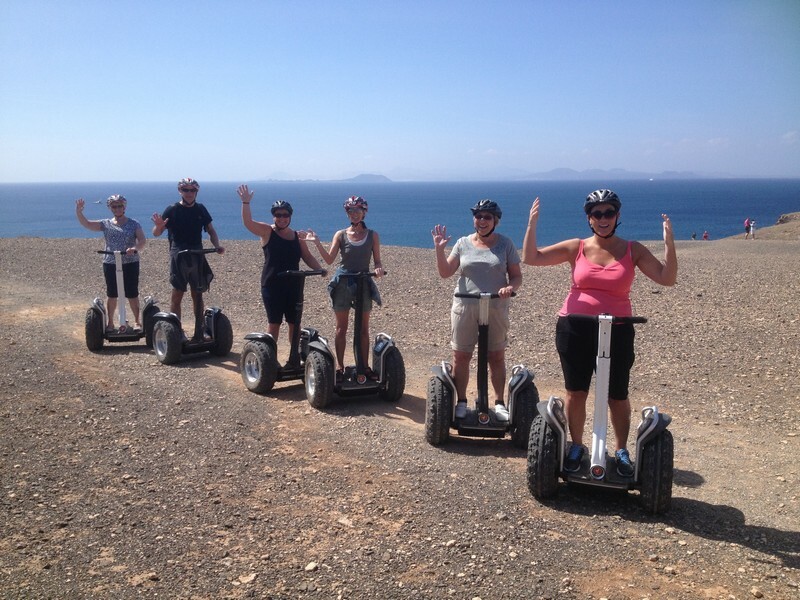 Based in Playa Blanca offering excursions on the electric vehicle called Segway. Segway Tours are based in Playa Blanca in Lanzarote and offers off-road excursions on the electric vehicle called Segway. As it uses aerospace technology it is very easy to learn and is suitable for anyone aged between 14 and 99 years old. It is self balancing so it is not as hard to learn as riding a bike. What a wonderful way to view the scenery such as the Papagayo Beaches, volcanoes and even sites of the ancient locals. Or you can climb to the top of Montana Roja (Red Mountain) and see inside the ancient volcano. There are panoramic views from here. Other tours include the sea front of Castillo de Aguila or Faro Pechiguera (lighthouse). The tour guide will explain interesting local facts on the scenery as you go. The tours operate Monday to Saturday. Prices vary from 30 to 50 euros depending on the length of the excursion (usually between one to two and half hours). Tours start with a lesson on how to handle the vehicle. Recommended footwear would be trainers, not high heels, flip flops or bare feet. Also be sure to bring water and sun cream with you. If booked in advance children under 6 years can ride in a carrier. 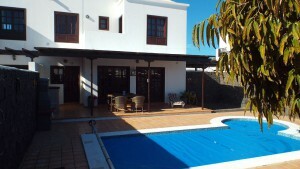 A villa to rent in Puerto del Carmen Lanzarote with three bedrooms and two bathrooms. The villa has a private heated pool and jacuzzi as well as free wifi. A beautiful villa to rent in Puerto del Carmen Lanzarote, which is very well equipped including free wifi internet access and satellite TV with lots of channels. Outside there is a private heated pool, jacuzzi and pool table, as well as an alfresco dining area and Canarian style barbeque. There is one double bedroom and two twin rooms with two bathrooms, one with bath and shower overhead and the other with a walk-in shower. A restaurant in Macher serving high end traditional Canarian cuisine. 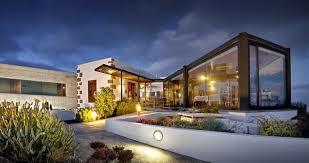 La Tegala is a fine restaurant situated in the village of Macher just above Puerto del Carmen in Lanzarote. The chef is German Blanco who has created a formidable menu which specialises in high end traditional Canarian cuisine. The restaurant enjoys amazing views towards Fuerteventura. Particularly recommended are any of the fish dishes, suckling pig, creamy squid rice of the lobster, apple and avocado salad. The main courses start from around 20 euros. Bear in mind that the restaurant is close all Sundays and on Monday lunchtimes. It is also best to book a table in advance. Cards are accepted. The menu changes several times a year so regulars will never tire of the selection of dishes on offer. The chef believes in slow cooking to preserve all the flavours of the ingredients and to make the food richer in vitamins and proteins. As you walk into the restaurant you are greeted by a modern bar, with a large mural above, by the local artists Juan Gopar. There is an air conditioned dining room with panoramic views which can seat up to 40 people. Two further private rooms can be booked which can seat up to 12 people each. The restaurant was first opened in 2006 by the owner Antonio Hernandez. It took 4 years to complete the building and renovations of the restaurant and to fulfill his dreams for the site. La Tegala in ancient Canarian language means “vantage point” or “height”, usually in defensive or religious terms, but quite apt given the panoramic views. A Playa Blanca villa to rent with air con in both bedrooms. 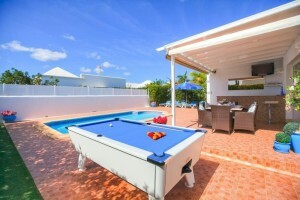 The villa also has free wifi throughout the villa, a private heated pool and a pool table. This Playa Blanca Villa to Rent with Air Con is situated in the Montana Roja area of the resort and has two bedrooms and two bathrooms. Both bedroom have air conditioning. There is free wifi internet access throughout the villa as well as a large Smart TV with satellite channels including ITV, BBC and Sky channels. Outside the villa has a private heated pool and hot tub, both with night lighting. There is a solarium bed and a comfortable seating area. A separate covered terrace with an alfresco dining area is provided with a Canarian style barbeque. 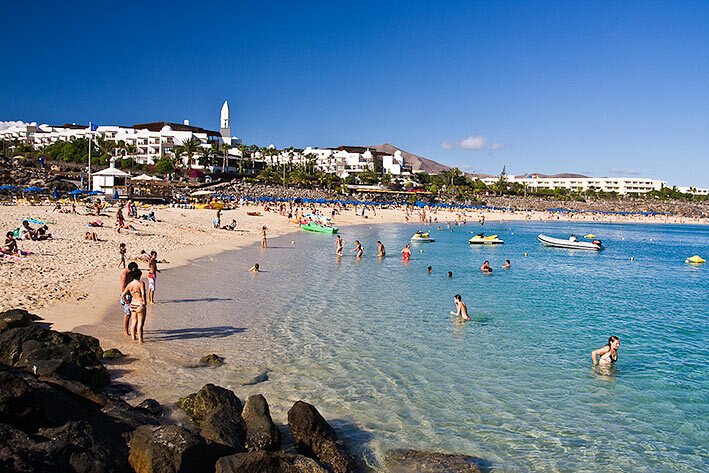 A popular beach in Playa Blanca, Lanzarote. This beach is very popular with tourists as it is set in a bay and provides calm waters for swimmers and snorkellers. The honey-coloured sand is soft and the waters shallow which also makes it perfect for families with small children. There is a beach side promenade where you will fine ice cream shops, retaurants and play areas. Water sports are also available including banana rides, parascending and jet-skiing. Another very nice beach in Playa Blanca. Playa Flamingo is an attractive, safe and clean beach to the West of the resort of Playa Blanca. Although just outside of town, there are a number of restaurants and shops available. It is the nearest sandy beach to this villa, just a short car ride away. However, there are lifeguards on duty on this beach. The water is also gently shelving, so again great for families with young children. A four bedroom detached villa near to the Marina Rubicon in Playa Blanca, Lanzarote. The villa has a private heated pool and free wifi internet access. This villa to rent in Playa Blanca Lanzarote has four bedrooms and can sleep up to 8 people. Each of the bedrooms has an ensuite bathroom and the master bedroom also has it’s own dressing room. Outside there is a private heated pool, surrounded by a large sun terrace with 8 sun loungers. There is also a covered terrace with patio table and chairs and a barbeque for alfresco dining. The lounge is comfortably furnished with 3 large leather sofas and satellite TV. The kitchen is well equipped including a washing machine and dishwasher and a large dining table. One of the islands of the Chinijo Archipelago in the Canary Islands. 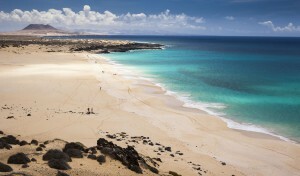 The Chinijo Archipelago is situated in the North East of the Canaries and North of Lanzarote. It consists of the islands of La Graciosa, which is the largest of them, Alegranza, Montana Clara, Roque del Oeste and Roque del Este. The only populated island is La Graciosa, where 700 people live. It is a mile wide and you can walk around the island in a day. It belongs to the municipality of Teguise and forms part of the nature reserve Parque Natural del Archipelago Chinijo, which also includes Los Riscos de Famara, the rocky coastline in the North of Lanzarote. Part of the attraction of the island is that there are no hotels and no roads, just sand or dirt tracks. This makes it ideal for hiking. You can also hire mountain bikes at the harbour or book safari island trips. There are plenty of long golden sandy beaches which are unspoilt and deserted. Playa de las Conchas is the most impressive of these on the North West coast, from where you have views of the other islands in the archipelago. The other islands can be reached by fishing boats but it is not allowed to land on them, because they form part of the Natural Park and are home to some endangered species. It is also home to rabbits and partridges who thrive on the islands. Guests staying in comfort on Lanzarote can take day trips to Las Graciosa by taking a ferry from Orzola harbour. The ferries depart 3-4 times per day and the journey is around 30 minutes long. The ferry docks at Caleta de Sebo, which is where Jean de Bethencourt, the conquerer of Lanzarote, would have landed in the early 1400s. Most of the inhabitants live in Caleta de Sebo, which has a post office, bank, 2 supermarkets, cafes and restaurants. The rest of the inhabitants live further along the coast in Casas de Pedro Barba. A three bedroom villa with private gated pool and jacuzzi. 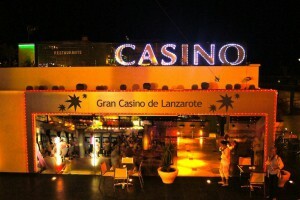 It is situated in the resort of Puerto del Carmen in Lanzarote. This Lanzarote villa with gated pool has three bedrooms and is situated in the Puerto del Carmen resort in Lanzarote, which is in walking distances of all the amenities including restaurants, shops and the beach. It has a gated pool and jacuzzi and the lower terrace with plenty of sun loungers. The upper terrace has a covered area for alfresco dining with a table and chairs and a barbeque. There is satellite TV in the living room as well as all three of the bedrooms. There are 2 bathrooms including an ensuite bathroom. The villa has all the mod cons including a dishwasher and washing machine. Norman knight who broke his lance on arriving on the island, declaring “Lanza rota” – meaning broken lance. Lanzarote may have been named after a Genoese sailor called Lancelotto, who landed on the island in 1312. Or some say that it was down to the Norman knight Jean de Bethencourt who broke his lance on arriving on the island and declared “Lanza rota”, meaning broken lance. Alternatively, it could be due to the French nobleman, Lancelot, who came tot he island on one of Bethencourt’s expeditions. 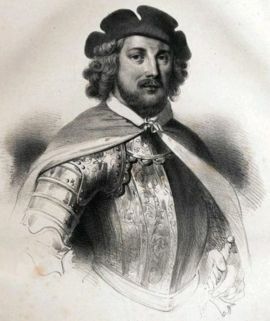 The most important expedition in the history of Lanzarote was ordered by King Alfonso IV of Portugal. The sailors on this expedition counted 13 islands in the Canaries. There were 7 major islands: Tenerife, Lanzarote, Fuerteventura, Gran Canaria, La Gomera, El Hierro and La Palma. Then they also counted 6 minor islands: Alegranza, Montana Clara, La Graciosa, Roque del Oeste, Roque de Este and Lobos. The sailors were greeted by the local Guanches graciously, but sadly in the years to follow there were many private raids. 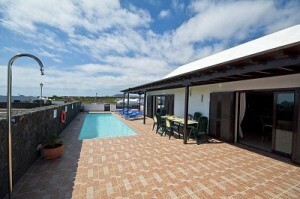 Villa rentals in the Playa Blanca resort of Lanzarote available through holidays4u.org. Ring us or email us for availability and further information. Villa Garcia is one of our villas to rent in Playa Blanca. It has four bedrooms and four bathrooms and is situated in the Marina Rubicon area of Playa Blanca. It enjoys a sea view and has a private heated pool. A covered terrace offers shade for alfresco dining and there are sun loungers around the pool. Inside the villa has been decorated in a modern style with all the mod cons including satellite TV, a DVD player, washing machine and a dishwasher. The villa is wheelchair friendly. Papas arrugadas (wrinkled potatoes) are a speciality in Lanzarote. they are grown in the black volcanic soil and have an almost nutty flavour. They are often served with mojo made from spices, herbs, vinegar, olive oil and garlic. Two types of mojo are red mojo, flavoured with peppers and chillies and green mojo flavoured with parsley or coriander. Papas Crias (wild potatoes) are grown on the rocky hillside and have an almost nutty flavour. Fish is a speciality in Lanzarote and is caught in local waters. Three of the most popular on the island are cherne (sea bass), vieja (parrot fish) and dorada (sea bream). Golfo is made from maize flour and toasted corn. In the past when bread was a luxury it was ground in windmills on the island and was a staple eaten with every meal. By the late 19th century break became a staple and today golfo is used to flavour and thicken stews, stocks and soups. The famous Malvasia wines are cultivated on volcanic ground, yet they are amongst the best in the world and regularly win lots of internation prizes. A three bedroom villa in Puerto del Carmen with air conditioning and wifi internet access. There is a private heated pool. This villa in Puerto del Carmen with air conditioning has three bedrooms with wifi internet access and satellite TV. The lounge is comfortably furnished with two leather sofas and an armchair. There is a smart wooden dining table and 6 chairs. The kitchen is fully equipped with a dishwasher and a washing machine. The master bedroom has a super king-size bed, the 2nd bedroom has a double bed and the 3rd bedroom has 2 single beds. The villa has a private electrically heated pool surrounded by a very private sun terrace furnished with sun loungers and a sun parasol. There is a covered terrace with patio table and chairs and a barbeque for alfresco dining. The villa is all on one level but there are 3 steps down to the pool area. Penelope Cruz regularly holidays in Lanzarote after filming Broken Embraces in 2008. David Cameron enjoyed his first holiday in Lanzarote over Easter 2014 in the resort of Playa Blanca with his wife Samantha and three children. The holiday included surfing in Famara, a visit to the old capital of Teguise and a swim at Playa Chica in Puerto del Carmen. The family also visited the North of the island. The family’s holiday party included bodyguards. Omar Sharif arranged for a holiday villa to be built for him in the 1970s. The villa was called Lagomar in the small town of Nazaret. Unfortunately, he lost his house in a game of cards and there is now a leading restaurant on the grounds of the house.